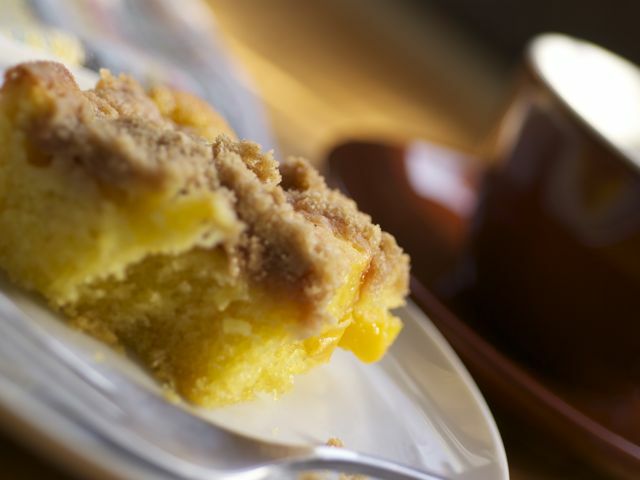 When peaches are in season, you can't go wrong with this coffee cake, with slices of fruit peeking through the batter. It's a reliable recipe for just about any stone fruit, from cherries to nectarines (my grandmother used to make it with plums). This is another streusel-crowned cake, but you can replace that topping with a sprinkling of 1 tablespoon granulated sugar mixed with 1 teaspoon ground cinnamon. Position a rack in the center of the oven and preheat to 350 degrees F. Lightly butter the inside of an 11½ x 8-inch baking dish. Dust with flour and tap out the excess. To make the kuchen, sift together the flour, baking powder, and salt in a medium bowl. Beat the butter in a medium bowl with an electric mixer on high speed until the butter is smooth, about 1 minute. Gradually beat in the sugar, then continue beating, occasionally scraping down the sides of the bowl with a rubber spatula, until light and fluffy, about 3 minutes. Gradually beat in the eggs, then add the vanilla. Reduce the mixer speed to low. In thirds, add the flour mixture, mixing well after each addition and scraping down the sides of the bowl as needed. Spread the batter evenly in the pan. Arrange the peach slices in rows on top of the batter. To make the streusel, combine the flour, brown sugar, cinnamon, and nutmeg together in a medium bowl. Add the butter and, using your fingers, rub the ingredients together until they form a soft dough. Crumble the dough in pea-size chunks evenly over the peaches. Bake until a wooden toothpick inserted in the cake comes out clean, about 35 minutes. Let cool in the pan on a wire cake rack for 20 minutes. Cut into slices and serve warm, or let cool completely and serve at room temperature. To peel peaches, bring a medium saucepan of water to a boil over high heat. Add the peaches and heat just until the skins loosen, about 30 seconds. Drain and rinse the peaches under cold running water. Using a sharp knife, remove the skins.